Who will be the next American Idol? The sixteenth season of American Idol will air Fridays and Saturdays on M-Net channel 101 from April 13 at 19h00 until 21h00. Award-winner Ryan Seacrest returns to host this popular music competition series, bringing with him his larger-than-life personality and extraordinary talent for entertaining. 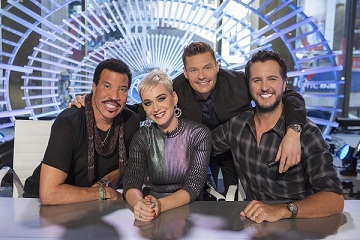 Joining him as judges of the next generation of superstars are Grammy ­and Emmy-nominated music luminary Katy Perry, country music superstar Luke Bryan and music icon Lionel Richie. American Idol’s profound effect on the music industry is far-reaching and continually growing, launching the careers of superstars such as Carrie Underwood, Kelly Clarkson, Jennifer Hudson, Katharine McPhee, Jordin Sparks, Adam Lambert and Chris Daughtry, among many others. The Idol alumni are responsible for 13 Grammys, over 61 million album sales, 47 Platinum records, 444 Billboard no. 1 hits, 257 million digital downloads, two Golden Globes and an Academy Award. To accommodate the premiere of American Idols season 16, which has already started in the US, Nashville season 5 and Riverdale season 2 will take a scheduling break. This scheduling break will ensure that the channel goes live with the finale of the reality competition. New episodes for Nashville season 5 will return on May 4 at 21h00 and Riverdale season 2 will return on April 28 at 20h00.